(Newser) – An Instagram post about his wife's beauty did not go the way Robbie Tripp likely thought it would. The self-described entrepreneur and "husband to a curvy goddess" posted a picture of himself and his bathing-suit clad wife Sarah to Instagram last week, where he explained that though he was teased as a teenager for his attraction to "girls on the thicker side," he's since learned about feminism and unrealistic standards of beauty and can fully embrace his love of curvy women. 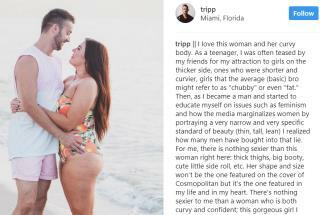 "For me, there is nothing sexier than this woman right here: thick thighs, big booty, cute little side roll, etc.," he writes, encouraging other guys to rethink the lies peddled by the media that they've bought into, because a real woman "has beautiful stretch marks on her hips and cute little dimples on her booty." While some have praised him for the post, most of the responses have not been so kind. Have any of the females who criticized this honest man for his taste in women ever served the pleasure of a man or been asked to do so? My guess would be NO, for obvious reasons. I would also guess that they are also motivated by jealousy for his wife, who appreciates what she has. This man was not trying to 'somehow solve centuries of sexism,' with his Instagram post. I'm a feminist and his preference cannot be 'outdated,' it's HIS preference. This ranting woman is just an idiot. American women are told by the media that we're less than and won't be loved if we don't uphold to a certain impossible Photoshopped standard of beauty. There's more to life than trying to be a size zero, and there's more to life than chastising a man for telling the world he thinks his wife is beautiful. I think what he said was great. I get really "triggered" (might as well use their jargon) by these idiots see "sexism" where none is intended.